The chief of South Korea's corporate watchdog said Thursday that his agency will get tough on any unfair business practices. 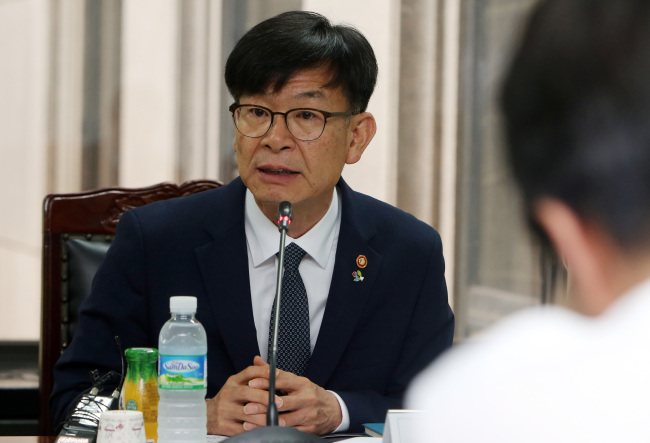 "Unfair terms of contracts for subcontractors and any other business practices, such as an unreasonable cut in selling prices, would be targeted by our investigation," Fair Trade Commission Chairman Kim Sang-jo said during a meeting with heads of ship-parts suppliers in Busan. The FTC has been stressing that it will promote fair business practices and take stern measures against big companies that abuse their dominant positions. Smaller suppliers argue that large players have been involved in unfair business transactions, such as delayed payments, returns and reducing supplied goods. Many policymakers have blamed such practices for squeezing the bottom lines of smaller companies and licensed shops, which they claim has widened the profit gap with high-earning large enterprises.